Elounda Gulf Suites and Villas offers a range of one & two bedroom suites, each with ensuite bathrooms with baths & showers, separate living room & balcony. The Luxury Villas range from one to three bedrooms, each with a private pool & spa pool, separate living room & fully equipped kitchen. Elounda also offers one to four bedroom Spa Villas, fully equipped and including a private pool with spa pool & jetstream, private sauna, hamman & gym. Elounda Gulf Villas and Suites is located on the north eastern coast of the island of Crete, in southern Greece, just 2.5km away from the Village of Elounda and a leisurely 50 minutes drive from the Heraklion International Airport. Airport transfers or car hire can be arranged. Elounda Gulf Villas and Suites is set in a magnificent location with spectacular views over the Gulf of Mirabello on the Greek island for Crete. 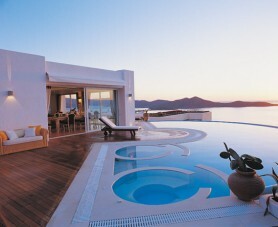 Elounda is an exclusive retreat for those seeking relaxing, luxury and privacy within a five star resort facility. With a full range of amenities Elounda is a beautiful compromise between independence and quality and provides guests with luxurious accommodation in refined surroundings. The Resort is furnished with a range of suites and independent villas including private pools and spas, gyms and saunas. A gourmet restaurant and bar are onsite to provide guests with a wonderful range of local and international cuisine. Elounda Villa (approx 120-150 m², max 4 guests): 2 master bedrooms with en suite bathrooms with bath & whirlpool, living room, fully equipped kitchen & private pool with Spa Pool. Elounda Gulf Resort includes full amenities including complimentary use of the gymnasium, a DVD, CD and book library for all guests. Available water sports activities include water skiing, wind surfing, tennis, kayaking, canoeing, boat excursions, scuba diving, paragliding & pony trekking, For all room types additional services are offered including: babysitting, private massage, personal shopping delivery and laundry services. Villas guests can also enjoy private butler service, an in house cook and private dinner parties, by prior arrangements. Elounda has an onsite restaurant open for breakfast, lunch and dinner where sophisticated meals are served in casual or elegant style. Local and international dishes are prepared to the highest standard using the finest ingredients and local produce. Guests can also enjoy a full Greek Meze menu most evenings. A lounge bar offers refreshing drinks by day and cocktails till midnight in an sensually lit atmosphere. The villages of Elounda and Ag. Nikolaos are only 5 & 10 minutes drive away. The surrounding area offers many restaurants, local taverns, shops and boutiques. The nearest sandy beach is 2.5 km away.